Detailed Description: Pass & Seymour 2-Pole 3-Wire Specification grade single receptacle in brown color has one-piece brass, triple-Wire power contacts for high conductivity and durability. It has a tamper-resistant nylon face with a corrosion-resistant steel plated strap locked into it. It features a sturdy thermoplastic back body to resist pulling away from face/body assembly. It is rated at 250 VAC, 20 Amps. It has isolated terminal compartments that offer positive conductor containment. It has 6-20R NEMA configuration. 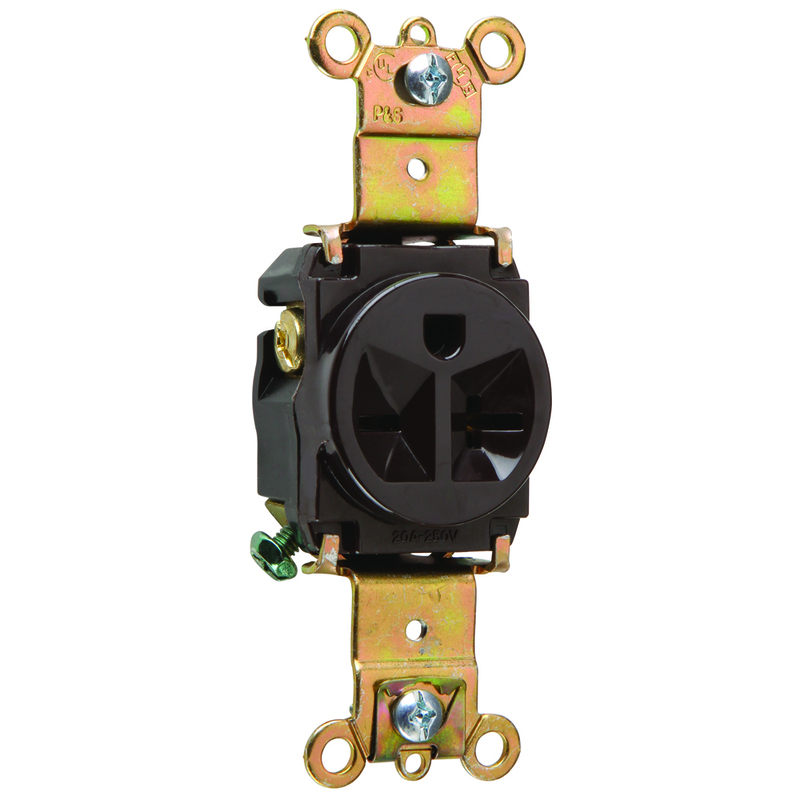 It is provided with an internal back wired screw-pressure-plate to conveniently accommodate size 14 - 12 AWG solid/stranded copper/copper-cladded wires. Heavy-duty specification grade receptacle comes with easy-to-access line-contact, break-off connecting tab for quick split-circuit wiring. Receptacle has an auto-ground clip for positive grounding. It provides side and back wiring termination for firm installation. It includes tri-drive terminal and screws for easy mounting. It measures 1.320 Inch x 1.093 Inch x 3.280 Inch. Receptacle is UL listed, CSA certified and meets UNSPSC/Trade Agreement Act compliance. Special Features Corrosion-resistant, plated steel strap locked in to face and back body to resist pulling away from face/body assembly. One-piece brass, triple-wipe power contacts for lasting retention. 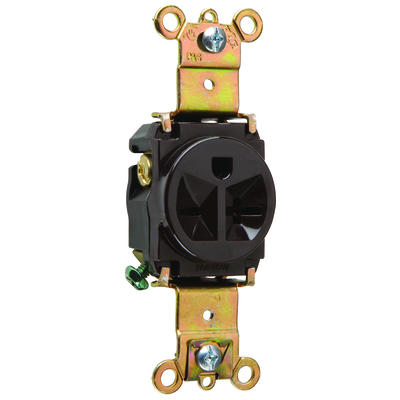 Easily accessed break-off, line-contact connecting tab for fast, easy split-circuit wiring. Impact-resistant nylon face and thermoplastic back body. Internal screw-pressure-plate back wire capable of accepting #14 - #10 AWG solid or stranded copper or copper-clad wire. Terminal compartments isolated from each other for positive conductor containment. Tri-drive terminal and mounting screws. Auto-ground clip assures positive ground.